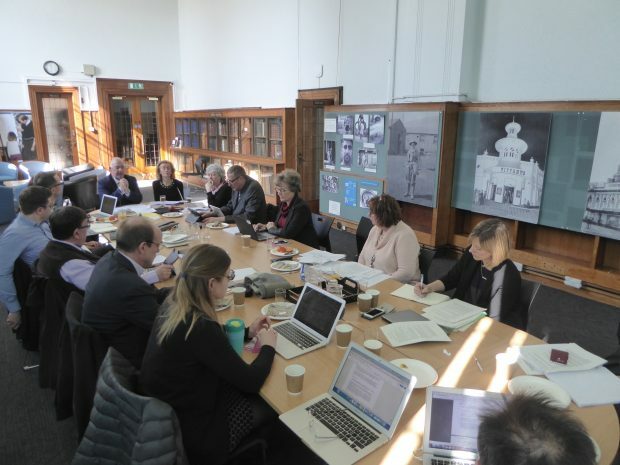 For its 19th meeting, on Monday 19 March, the Taskforce met in Sheffield Central library. Before the meeting, we were given a tour of the building, from top to bottom. It was built in the 1930s and is listed, with lots of original features still in place - from art deco ironwork grilles to door handles and woodwork. The Graves Art gallery is on the top floor, and there is a small library theatre in the basement which seats over 260 people. 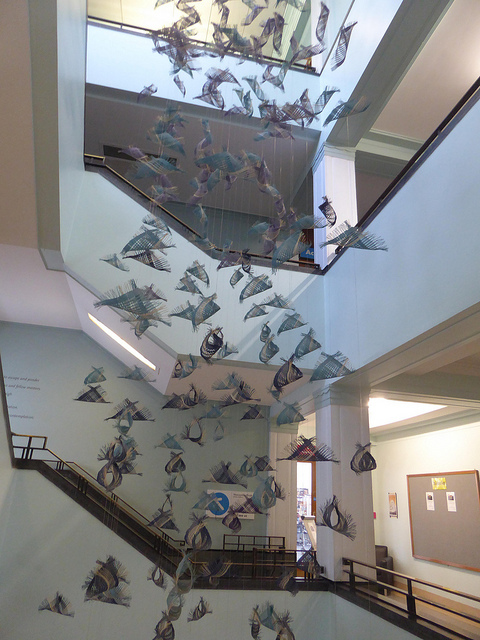 The main stairwell is decorated with library related quotes, and an artwork that displays many suspended pieces of cloth - looking like a flock of blue birds. On the first floor are meeting rooms, notably the Carpenter room, named after a local man who was prominent in the LGBT movement, plus a large space devoted to local history. It was clear from the many posters and banners that lots of activities take place, exploring and celebrating local people and events in Sheffield’s history. On the ground floor is the lending collection, plus a newly re-configured space, the “biography room”. Here they have placed some of the more modern furniture that used to be in the main reference room - and the room has become a well used quiet study space. The lending collection is in a large room, with solid static shelves. The new Sheffield Reading Room, formerly known as the reference library (also on the ground floor), is now a much more flexible space. Part of it houses the Business and IP centre, with a couple of pods for 1-1 meetings between people with ideas, and business advisors, plus display cases showing the work of entrepreneurs who have seen their ideas come to life, with the help and support of the BIPC. 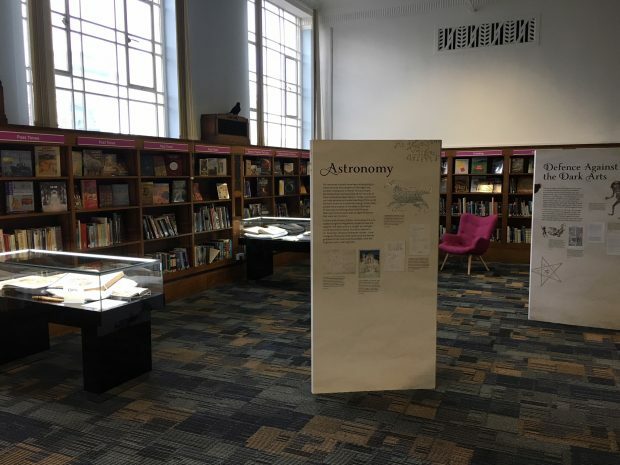 The rest of the space is now used both as a reading room, and for specific events and exhibitions such as the very successful Harry Potter: A History of Magic in association with the British Library. The other space on the ground floor is filled with public access computers. There is a booking system in place and each time we passed, all spaces were occupied. 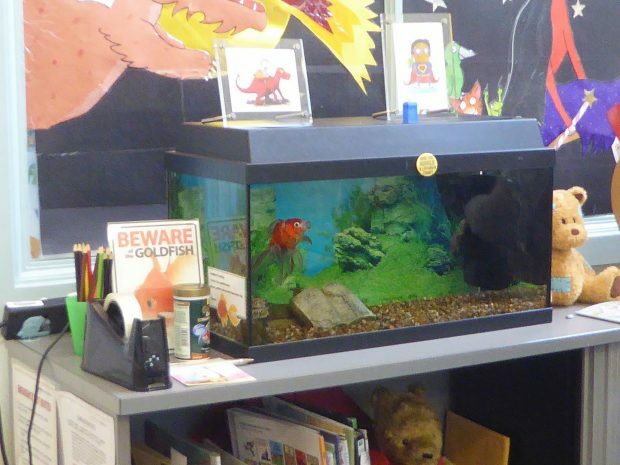 Finally we descended to the bright and colourful children’s library, and met the first library fish we’ve encountered! This is a large space which works well for events and children’s activities, but access is an issue. If you can’t use the stairs, you have to use a back door and weave your way through the back corridors of the library. We returned to the Carpenter room for an introduction to a piece of work carried out recently in Darnall - a deprived area of the city with high numbers of new arrivals over many years. 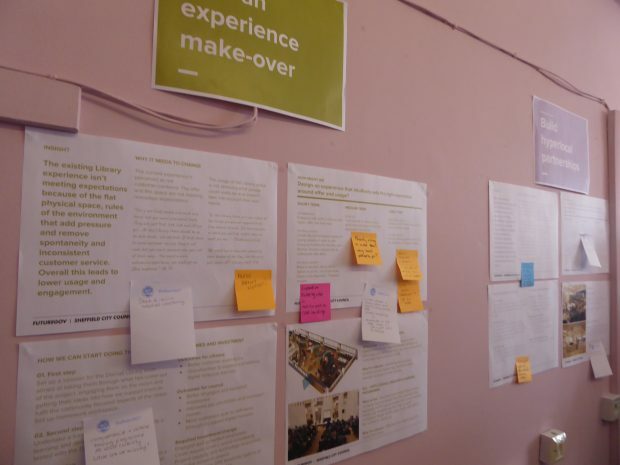 A feasibility and community engagement project, funded by One Public Estate (OPE), Sheffield put together a team involving representatives from different parts of the council, together with advice from FutureGov (who have a track record of user centred service design). 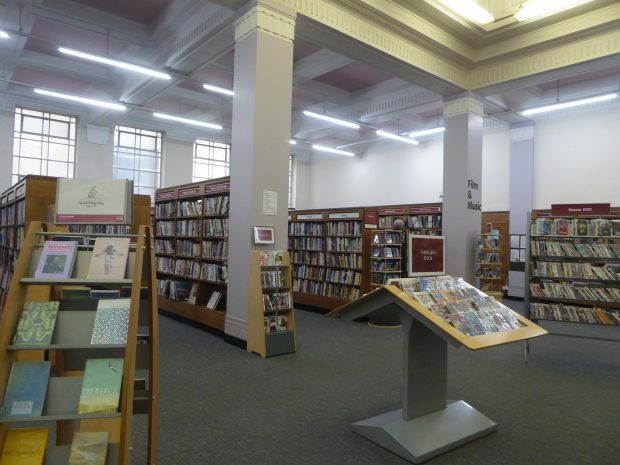 They looked at the range of services delivered in that part of the city, with the aim of exploring whether and how services might be combined within the Library. The approach chosen was to undertake in-depth discussions - with individuals providing insights - rather than large consultation processes. Darnall had previously had very poor response rates to usual survey techniques. 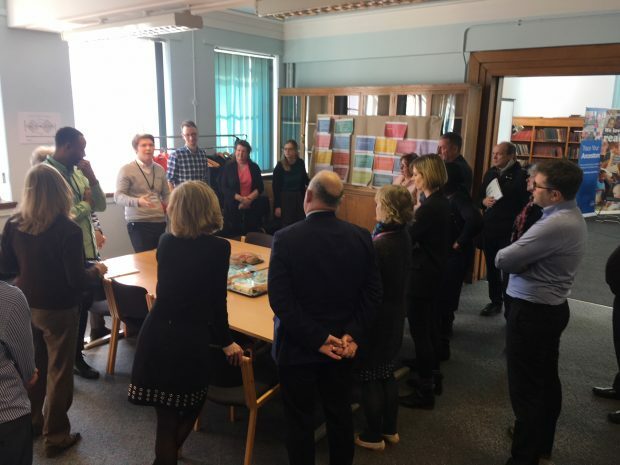 Representatives of the team talked the Taskforce through the process and shared examples of the insights and opportunities uncovered for the library and its community and explained how the result was a new vision for the library at Darnall. The Taskforce walked around a number of displays produced by the team and put questions to team members. The image above is from a session they ran towards the end of the process, when insights from the community had been gathered and analysed, and presented to teams from the council. As post-it notes illustrate, these sheets prompted further ideas and questions. The picture below also illustrates a technique to show that these feedback sessions were run differently: rather than sit around a table and watch a presentation, results were taped up around a room, and participants were encouraged to walk around, hearing from the team, but also literally walking through the results. Sheffield believed that bringing together library staff, locality officers, and the change team had created a unique blend of officers committed to making a difference for Darnall and promoting a ‘Libraries First’ ethos within the council. This project is now being used as an exemplar of community engagement across Sheffield City Council at managers’ events chaired by the Chief Executive. Briefings had also been well received by the Clinical Commissioning Group who are located in Darnall. I’ve asked the team to write us a blog post to share more of the details about their approach and evolving plans. Sheffield’s Cabinet member for Libraries and Culture, Cllr Mary Lea talked about the ongoing discussions around plans for the Central Library, and shared information about their Heart of the City project. The proposal for a new central library is still on the table, but there are many different options to investigate. There is also clear support for maintaining and developing the existing building. The rest of the day was spent in a full Taskforce meeting, minutes of which have been published on GOV.UK. Our next meeting will take place on 12 June in Barking Library, part of the Barking Learning Centre (BLC).